Food availability is a necessary condition for food problems. India is enough self-sufficient in cereals but deficit in pulses and seeds of oil. Due to different types of changes in ways of consuming, demand for food, vegetables, milk products, meat, poultry, and fisheries has been increasing. There is need to increase crop diversification and improve allied activities. It may be noted that the slowdown in agriculture growth could be attributed to structural factors on the supply side, such as credit, technology, land and water management, public investment, etc., rather than globalization and trade reforms as per subjected. Accessibility to the food can be triggered through employment due to growth in labor intensive sectors and/or through social protection programmers. 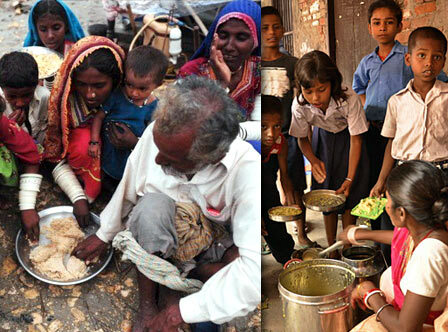 Malnutrition problem is much broader than that of access to food. The South Asian Enigma (levels of malnutrition in Asia are higher than in Africa) is well known. India has malnutrition levels almost the levels double those of many countries in Africa. This problem needs a disciplinary approach covering diet diversification including micronutrients, women’s empowerment along with education, health, sanitation, hygiene etc. After remaining a food deficit country for about two decades after independence, India became largely self-sufficient in food grain production at the notable level. There are hardly any food grain imports after 1970s. Food production in the country increased from about 50 million tons in 1950-51 to around 233.9 million tons in 2008-09. The growth rate of food grains has been approximately 2.5 per cent per annum between the years of 1951 and 2006-07. The production of many other food products like oilseeds, cotton, sugarcane, fruits, vegetables, and milk has also increased appreciably. The experience gained from the two decades proves that growth rates of production and yield have decreased for crops in the period 1996-2008 as compared to the period 1986-97.The growth rate of food grain production declined from 2.93 per cent to 0.93 per cent in the due course of same period. The growth rate of production was much lesser than that of population in the latter period. Similarly, growth rate of yields of food grains declined from 3.21 per cent 1.04 per cent. There was also a decline in growth rates of production and yields for cereals, rice, oilseeds, pulses and wheat. First, the prices of food grains like rice and wheat were discouraging. So, the farmers landed up with very low net returns even during years of bumper production. By concentrating on other crops like cotton, chili and sunflower the farmers were encouraged to get maximum profits. Second, the productivity of basic food crops that is rice and wheat was minimal in some regions like dry lands due to much moisture stress sensitivity of these particular crops. Therefore, they began encouraging farmers to come back to oil seeds and other pulse crops and rich value medicinal plants which does not need much quantity of irrigation compared to that of field crops, they would certainly get higher profits. One of the main reasons for food security crisis at global stage is, the diversion of farming lands that were used for cultivating maize and wheat transformed into bio-fuel and medicinal plants in the United States, Asian and African countries. The recent preference for cultivation of sugarcane and other likewise field crops for producing of ethanol is considered a big challenge for the food security of the world. At the same period of time, simultaneously there has been notable increase in cultivating area of medicinal plants like amla, ashwagandha, sarpagandha and bio-fuel crops like jatropha revealed out in India during the recent years. The attention should be given to Climate – flexible Agriculture. In low rain and dry types farming areas, ways such as rainwater harvesting and storage, water shed management, improvement of soil physics and microbiology needs to be promoted widely. The practicing the use if fertilizer trees can enrich the soil fertility and help to improve soil carbon sequestration and storage can be promoted under the Green India Mission and also MGNREGA. A minimal number of fertilizer trees and a biogas plant in every field will help to improve enormously the productivity and profitability of farming’s of lands which are dry. It may also contribute to climate change mitigation. Obviously powerful innovations like genetic modification require professionally-led sequential structures. The Government of India has brought into practise, a most critically needed, Biotechnology Regulatory Authority Act for being discussed in Parliament. The goal of this act is to supply a professional and transparent Regulatory Body which can inspire public, political, professional and also media secrecy. It should be realized as soon as it can be. Besides, The Department of Biotechnology has initiated a program for organizing DNA Clubs in Schools to familiarize the young scholars with implications of human genome, rice genome, genetic modification and other aspects of food security and human wellbeing, which helps to promote critical understanding of the enormous progress made in Genome Analysis and Molecular-Mapping with reference to their implications for food and nutrition and public health. Also there is an utmost need for Setting up Agricultural Transformations Centers.